CRM capabilities combined with an e-commerce solution is greater than sum of the two separate parts. While the technical challenges confronted when mixing standalone CRM and E-commerce can be intimidating, FyNSiS is providing both capacities natively combined to enhance your return on investment. We have created the premier software package that e-commerce companies desire. Entirely developed into one solid and secure software application, it’s a package that integrates e-commerce CRM with the OpenCart shopping cart engine. What is so unique about our solution? It is a unified solution able to connect all e-commerce transactions from your website into a customer relationship application such as CRM, and do it from across any and all channels. While you are maturing from entry-level data processing, you need niche CRM capabilities and the advanced functionality which can only be found in some of the best enterprise applications. eComm CRM is software that permits the storage of customer details, information about customer orders, sales leads, and enables you to anticipate marketing opportunities in the future. OpenCart, Magento and numerous other platforms allow the creation of an e-commerce presence while our CRM package enables enterprises to succeed by helping users to enhance sales transactions. Mobile CRM (FyNCRM) is an integral part that makes the package a perfect CRM solution. An important part of this software is the capability to utilize CRM schemes for order status modifications and historical updates, thereby increasing customer satisfaction levels. 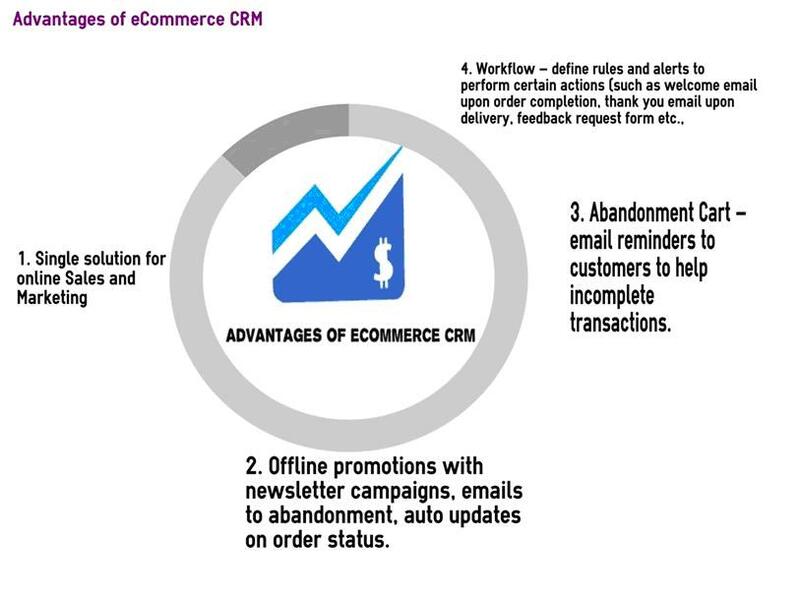 Put simply, e-commerce CRM applications have the ability to tackle your customer data, allowing you to attain insight into customer purchasing habits, market positioning, social media activities, buyer behavior, geo trends, etc – which gives you the power to cross-sell or up-sell and improve e-store revenues. Any e-commerce website is certain to expand quickly in a given niche market with this worthwhile information. Our integration is seamless and real-time – doesn’t require admin input which means no dependency on admin to run a cron job to pull or push data. Increase sales with the aid of built-in marketing analytics and campaign capabilities.